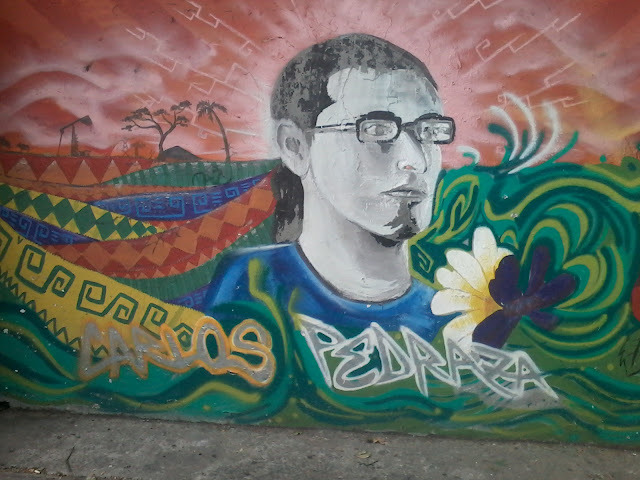 We don't live too far from Colombia's National University of Pedagogy (teacher's university), which is covered in murals. As I was walking past the campus today, this mural struck me as a fitting image for today's word: "injustice". Carlos Alberto Pedraza Salcedo was a Colombian social activist and human rights defender involved in campaigns and social movements such as: Movement of the Victims of State Violence; Never Again Project of Colombia; the Permanent Campaign Against Police Brutality, for the Guarantee of Human Rights and the Disbandment of the Mobile Anti-Disturbance Squadron; Association of the Political Movement of Social and Popular Masses of Colombia; The Peoples' Congress; and the National Agrarian, Peasant, Ethnic and People's Summit. He was disappeared on Jan. 19, 2015 and his murdered body was found on Jan. 21, 2015 far from where he had last been seen. Mural to memorialize the human rights defender at the National University of Pedagogy. Photo by Curtis Kline.